Garage doors were designed to move flawlessly when in perfect balance -- this is the point where they feel neither too heavy nor too light and hang at whatever level you decide to set them. Unfortunately, too many perfect garage doors fall into disrepair when owners refuse to do regular maintenance. It’s important to check your garage door balance regularly and adjust it when necessary. Oftentimes, your garage will need a garage door spring replacement in order to function correctly. 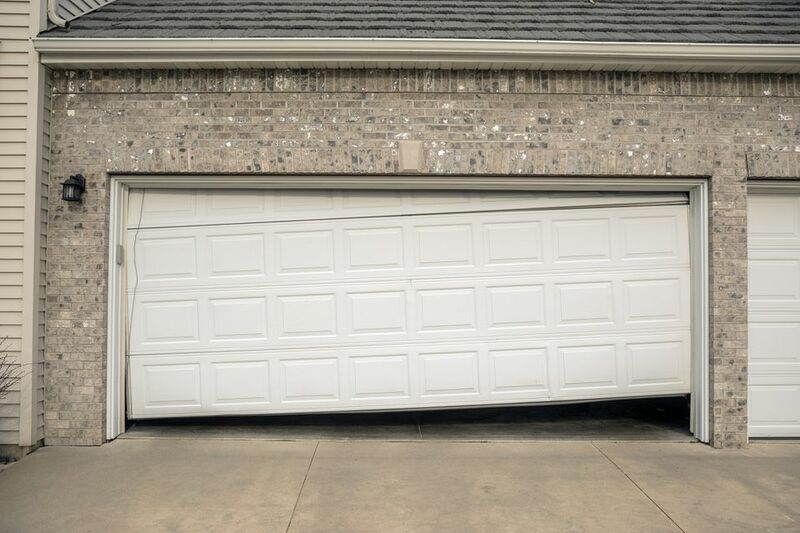 Please note: adjusting a garage door with torsion springs can be a dangerous affair, so contact your local garage door installer if you feel in the least bit nervous about performing this task. You may need to use a carpenter's level or something similar to help you achieve a fully balanced door. Before you can adjust your garage door, you have to know in which direction it’s out of balance. To do this, you’ll have to disconnect your garage door from your opener and check how well the door hangs on its own. Run the door up and down a few times to make sure it moves easily in its track -- you’ll need to deal with other impediments before making a balance adjustment. With your garage door moving smoothly in the tracks, run it up about half way and let go. Does it hover in place, fall to the floor, or slide upward? More than a little movement means your door is out of balance. Most commonly, doors fall down because they’ve lost tension on their springs, so that’s what we’ll discuss. The procedure is the same for over-balanced garage doors, just make sure to move the spring in the opposite direction. With an extension spring door, the goal is to take all the tension off the door before you even think about touching a spring. You can do this by opening the door all the way and propping it up with a ladder. Open it just as wide as you can, without hitting the garage door opener’s stop bolt, and place a clamp on the track on both sides to keep the door in place. Remove any safety cables from the springs before loosening the springs themselves. If they have a lot of give, you may want to consider replacing them. Otherwise, simply slip the spring off of the garage door bracket opposite the hanger and move it to the next hole away from the hanger. Do this with both sides before testing -- you should always adjust spring sets evenly. Now’s a great time to let the clamps lose and rest the door on the ladder below. Once you’re safely away from the springs, move the door up and down again to check the balance. You can decide from here if you need to further adjust the springs or if you simply need finer tuning. Make smaller adjustments using the S-hooks at the end of the pulley cables on either side of the door. Tighten the cable if you still need more tension by moving it to a lower hole. An extension spring door isn’t under nearly the tension that a torsion spring door is, making them much easier and safer to DIY. When you move into the realm of torsion spring doors, you can cause yourself significant injuries if you’re not paying close attention as you work. Like with an extension spring door, you’ll start by disconnecting the door and checking its balance, but that’s where the similarities end. For starters, you’ll work with the door in the down position. For maximum safety, place a set of c-clamps on the tracks just above the bottom set of rollers. This will prevent the door from lifting while you’re adjusting it -- and you’ll want that safety net. With a set of winding bars and an open-ended wrench sized for the adjustment screws, climb a ladder and position yourself off to the side of the adjustment collar of the spring you’re adjusting. Push one of your winding bars into the most vertical hole on the bottom of the adjustment collar until you hear it snap into place. This will help you hold the tension on the spring so you can safely remove the screws. Loosen the set screws with a wrench while holding the first winding bar, you’ll feel significant tension as the screws are removed. To adjust a door that can’t stay open, bring the first winding bar up to a 90-degree angle with the garage door -- this is a quarter turn. Place the second winding bar in the hole that’s now facing the floor and vertical to the door to help you hold everything in place while you return the set screws to the holes and tighten them down snugly. Remove the winding bars and repeat the process on the other torsion spring before releasing the c-clamps and testing the door. It may take a few trips up the ladder, but resist the urge to tighten your door too quickly -- this can lead to busted springs and serious injury. A quarter turn at a time will do it. Your garage door’s little annoyances don’t have to be permanent conditions, especially if you’ve learned how to rebalance your door as it ages. Check it periodically in case it needs further adjustments, but as long as your door is holding its own at half-mast, it should be good to go.